Time to eat all the incredible things in 2015! It is just me, or does the new year not really start until the first Monday of said new year? It’s kinda true. Please join me in forever being a Monday starter and reveling in this first REAL day of the new year… five days late. Indulge me. Don’t let me be a loner. My resolution this year is the same as last: I don’t want to eat one single thing that I don’t completely #omglove. At least not on purpose. I want to adore every bite I eat, to flip over each morsel I put in my mouth and keep food the wonderful, super enjoyable, nostalgic and perfect thing that it is in my life right now. To keep on loving it so much like I do right now, or even more if that’s possible. Which means I totally might have to cover my broccoli in cheese and use a bit more bacon grease when applicable, but hey. Whatever works. I am on a serious mission (again) to get out of the boring chicken rut. I went through a good ten months of not wanting anything to do with chicken, aside from the perfect roasted one here and there and maaaaaybe in taco form, and due to that I went back to boring basics since they were easy. Because, of course, if I wasn’t eating, I would just make the easiest thing. Total brat mode. The other thing is that I’m pretty nutso over this chili garlic combination these days – on meat, fish, vegetables, heck, even on grilled bread with nothing else. I love the spice and the slight sweetness. And! Then combined with the tangy yogurt dipping sauce… which gives it a cool and refreshing kick, I’m just so crazy about it. It lends loads of flavor to whatever foods I’m working with. Always a plus, of course. Soak a few bamboo skewers in water. Skewer 4 to 5 chicken pieces on each skewer. Heat a large skillet (or your grill!) over medium-high heat and add the olive oil (not if using the grill). 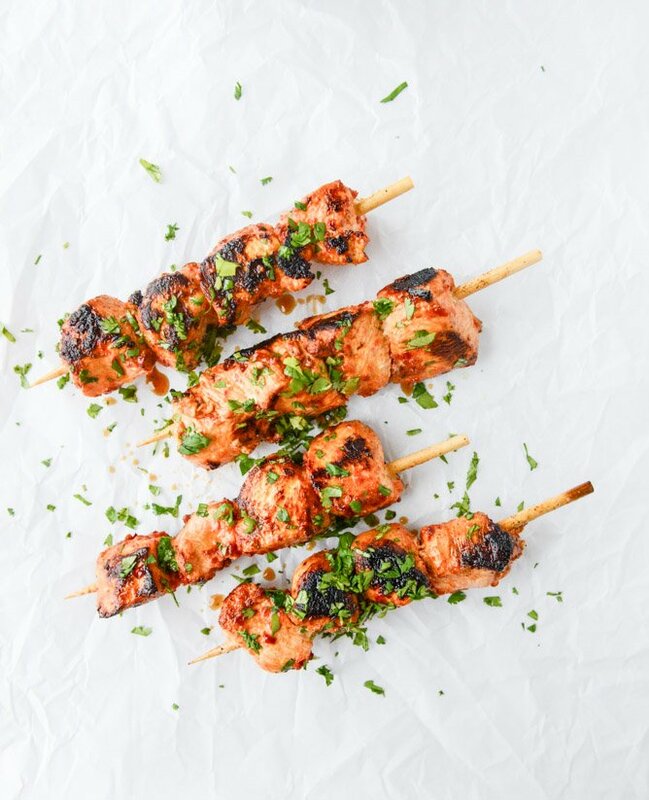 Add the chicken skewers and cook on each side for 4 to 5 minutes, until cooked through. Serve immediately with the yogurt sauce and extra lime wedges. a little chicken yogurt hug. Another winner! Delicious, even the next day–and dinner guests gobbled them up. Thanks! This recipe is wonderful! It’s Super easy to make (I’m not a good cook) and doesn’t take much time. 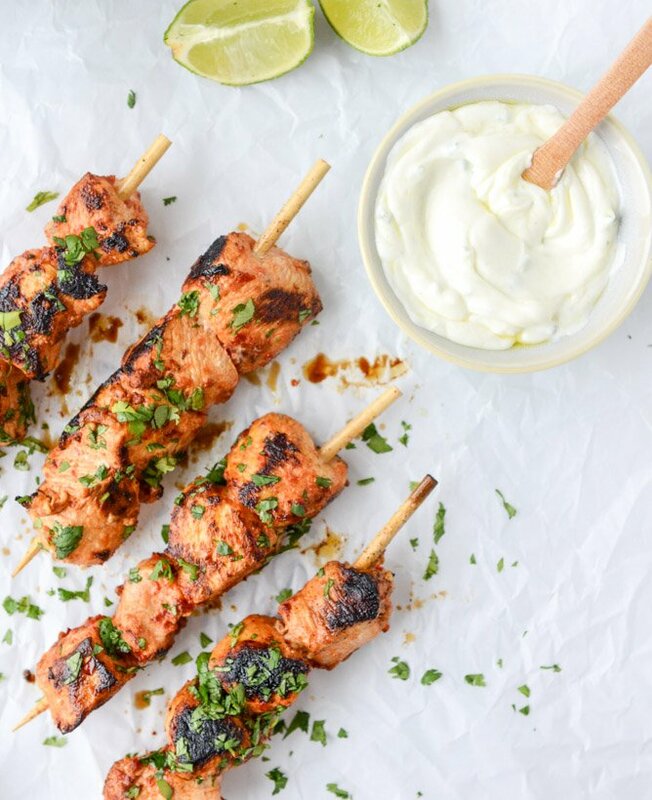 I could not find chili garlic paste and used chili garlic sauce and it was delish.The yogurt sauce seemed funky on its own but when paired with the chicken skewers it’s just right. I’ll definitely be making this one again. Thanks! This is AMAZING. I didn’t do the skewers – just put the sauce on some pounded breasts and grilled them. And honestly, I only had an hour and a half to marinate the chicken and it still turned out great. So easy, so fast – I will definitely be making this again. I made these, along with the yogurt sauce for a baby shower lunch. They were devoured. So good, I made a another batch for home. Super easy and delicious. It’s being saved as a family favorite. Great recipe! Very quick and easy, and I loved how tender the chicken was, just following the directions and cooking for 4min on each side. Definitely saving this recipe to make again and again! Pingback: Best Baby Shower Ideas For Food and Drinks & Baby Shower Checklist!